Are we having fun yet?! Day 4 of cookies and we’re talking Spritz today with Amanda from Fake Ginger. If you don’t already follow her blog then go fix that right now. I love her blog because she posts about food that my family would eat. I have made many of her recipes multiple times. Amanda and I met through twitter, and if you don’t tweet then I just can’t explain to you how you can become friends with somebody over there. It just happens. Even though Amanda and I have never met I was nervous and excited for her when she was in the hospital expecting her 3rd little guy. And since my real life friends can only smile and nod for so long while I talk about html code, page formatting, and photography it’s nice to have friends like Amanda around. That and she’s funny. I like to laugh. That is all. Take it away, Amanda! Hi y’all! 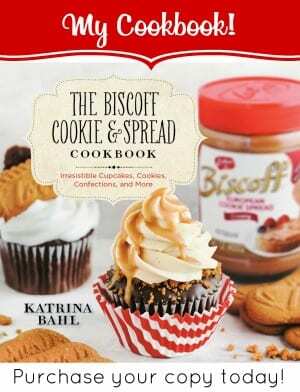 I’m so excited to be bringing some cookies to the cookie party today! If you don’t know me, I’m Amanda and I blog over at FakeGinger where I make more bread than my waistline can handle and talk about Real Housewives entirely too much. 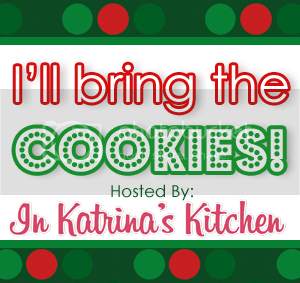 When Katrina emailed me about participating in I’ll Bring the Cookies, I responded immediately. A month of cookies? Uhh.. how do you say no to that?! I had a horrible time deciding which cookies to bring and eventually realized that the cookies I look forward to most around the holidays are those butter cookies you buy at the drugstore. You know the ones. They come in a little blue tin and can be found buried under a pile of clothes in my closet well into March. I love them. I used my cookie press to make them even more holiday-ish (if you don’t have one, they can be found just about everywhere this time of year – or you can simply roll the dough into a log, refrigerate for a few hours, thinly slice, and bake) and lots of green and red sprinkles! Place flour, sugar, butter, and salt in the bowl of a food processor; process until the texture resembles coarse crumbs. In a small bowl, whisk together egg yolks and vanilla; add to the processor with the motor running. Process until the dough forms into a ball. Fill your cookie press ¾ of the way full (do not chill the dough!) and form cookies on cool, ungreased baking sheets according to manufacturer’s instructions. Use a pastry brush to brush the cookies with the egg wash and decorate with sprinkles as desired. Bake for 10 - 15 minutes until the cookies are firm but not brown. Cool completely on a wire rack. Thank you to Amanda for bringing the cookies today! Be sure and check out Fake Ginger for recipes like Bang Bang Shrimp, Pumpkin Pizzelle Cannoli, and Caramel Apple Cinnamon Rolls. 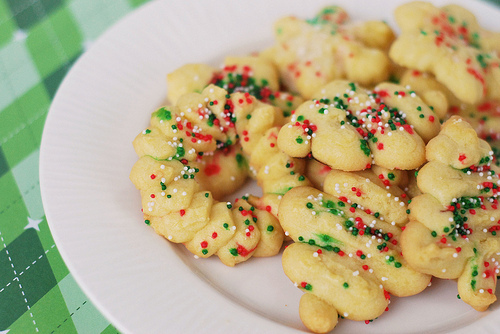 These cookies just scream Christmas. Love! 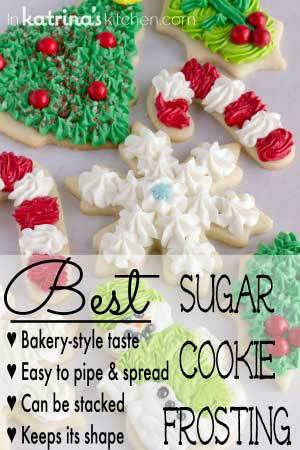 I love spritz cookies – they are so easy and look like a million bucks! Totally loving coming back here every day for a new treat! These are cute and perfect for Xmas! 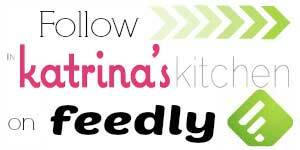 Great guest post 🙂 Going to check out the bang bang shrimp now! Those are so cheerful and happy! I can't believe it's actually almost Christmas! I've never made these but I always see them! I'm not sure how I've managed to never make or try one. I need to change that. Yes, please! These look perfect! These are beautiful. I'm up for anything with butter in the title! These look wonderful! I just got a (hand me down) cookie press, so I am so excited to try these out! Thanks! 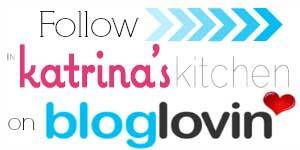 Ps – Love the new layout, Katrina! Yes, we're having fun! Such a classic cookie for Christmas~pretty and yummy! I love a good melt in your mouth cookie, saving this! The cookies look so good. I'm just got one so I'm so excited to make these. 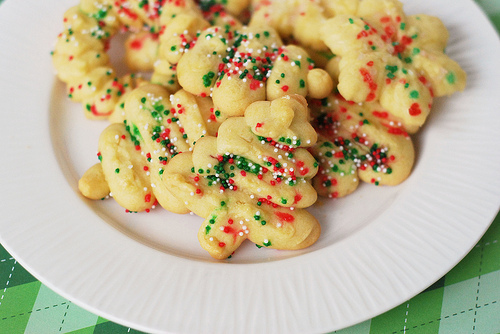 I have yet to make spritz cookies! And these are looking so scrumptious!! It wouldnt be the holidays without these. I found a cookie press at the dollar store and it works like a charm. love the cute spritz cookies! 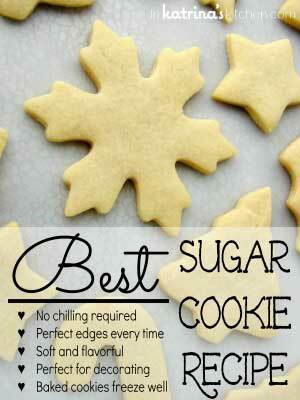 I just tried these cookies and was so hopeful! (My husband loves spritz at Christmas.) They weren't sweet enough and I had a hard time making the cookie press sqeeze out consistent cookie dough. Perhaps because of the high butter content it tended to continue to ooze out in between some of the cookies. sorry I tried this on. I usually think Martha makes a great recipe. Not so here.